May 28, 2007 issue – The attacks came in waves, with military precision. Hours after Estonia removed a World War II statue of a Soviet soldier from downtown Tallinn last month, virtual war broke out. News agencies, banks and government offices were targeted in a blitzkrieg of spam—an onslaught of billions of e-mails, many apparently generated in Russia, that brought down servers and jammed bandwidths to bursting. As “eTonia’s” famous digital-based free markets and democracy buckled under the strain, top NATO Internet security experts last week rushed to construct defenses against the world’s first massive cyberstrike by a superpower on a tiny and almost defenseless neighbor. With parliamentary and presidential elections coming up, Nashi and its sibling movements have an obvious target—anyone who presumes to challenge Putin and his ruling clique for power. Who might they be? Nashi recently issued a leaflet identifying them. This “Gallery of Traitors,” appearing in print and online, featured twisted portraits of such opposition leaders as former prime minister Mikhail Kasyanov and radical writer Eduard Limonov. They were declared enemies of the people, scheming to subvert their nation and turn it over to foreign spies and conspirators. Among them, too, are exiled Yeltsin-era oligarch Boris Berezovsky and Mikhail Khodorkovsky, the former billionaire brought down after he began funding opposition to Putin in 2004. 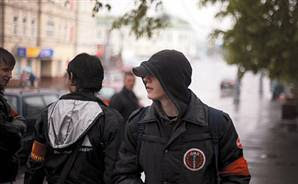 Veteran dissident Valeria Novodvorskaya likens Nashi to “a new Putin-jugend” modeled on the Hitler Youth. That’s an overstatement. Nashi and other groups may be fanatically loyal to Putin, but their rhetoric and methods are more like a sinister parody of democracy movements in Ukraine and elsewhere. Much of their activity is orchestrated by Vladislav Surkov, Putin’s right-hand man for political and media issues, who meets regularly with the groups’ leaders to organize propaganda and political campaigns. The Kremlin is lavish with its funding, too, says analyst Ilya Ponamarov of the Institute of Globalization Studies, both in direct cash contributions and encouraging state-owned businesses to sponsor programs. The institute estimates that the “Putin’s Communicators” campaign alone cost $220 million. And like the old Komsomol, the perks of membership are considerable. Members enjoy free admission to various schools of management, where they study government, business administration or public relations. They go on to allocated internships in top state enterprises such as Gazprom, Rosneft, state-owned television stations and even the Kremlin. Western leaders are growing increasingly alarmed at Russia’s new direction. 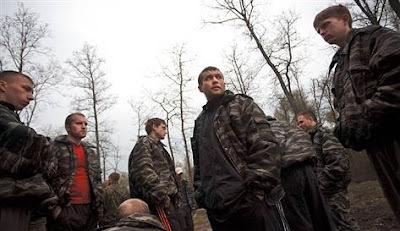 They have watched as it has retreated farther and farther from democracy under Putin’s rule. They have been dismayed at the spectacle of thousands of riot police beating down small numbers of protesters mustered by the country’s increasingly weakened political opposition parties. Last week U.S. Secretary of State Condoleezza Rice was in Moscow to take the temperature of relations, which have reached close to freezing. In his Victory Day speech Putin appeared to compare America to Nazi Germany, warning of the threats from countries with “contempt for human life and the same claims [as the Nazis] of exceptionality and diktat in the world.” Putin has also vehemently denounced U.S. plans to station ABM missiles in Eastern Europe. “Everyone is frankly scared of the way which Russia is going, but no one knows what to do about it,” says one European diplomat in Moscow, not authorized to speak on the record. With the Kremlin aggressively pursuing its enemies at home and abroad, and grooming a militant youth movement as de facto enforcers of its nationalist vision, Russia’s neighbors are wondering with growing concern which of them could be next.